Meet Triteia, a new chemical dissolving solution that brings unprecedented accuracy, control capabilities and process quality to the field of agricultural water treatment. 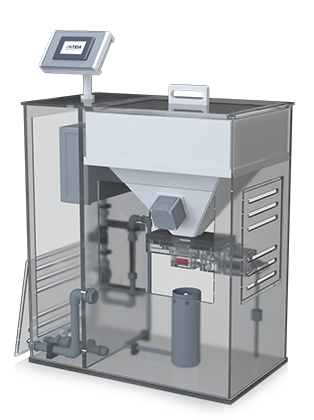 Highest level of accuracy using a unique and innovative dosing feeder together with continuous process measurements and control. Local and remote control capabilities enable you to streamline your process from wherever you are and save costs. Easily adapted to your water treatment needs and processes. Triteia offers some pre-programmed control functions, specially configured for irrigation systems. Compact, efficient and robust system structure, specially designed to fit typical field installations. The use of surface water or reclaimed water to irrigate agricultural crops is increasing. This gives rise to a growing need to treat this water in order to prevent microbiological contamination and protect irrigation systems from organic and biological fouling. Although alternative water treatment technologies exist, chlorination by liquid sodium hypochlorite is still commonly used for the treatment of water for agriculture because of its relative simplicity, availability, and low cost. In order to ensure the quality of the water treatment process for irrigation and other agricultural applications, the accuracy of the chlorination process is important. However, an even more important aspect in agriculture is the economical use of chlorine. The reasons for this are that the water quantities used for irrigation are large and also, chlorine consumption in surface water is relatively high compared to its consumption in ground water. Triteia brings an innovative solution to the world of water treatment – an accurate and reliable, yet simple and affordable granular chlorination system for the treatment of water for irrigation and other agricultural applications. Triteia offers standard chlorination systems that are especially designed for use as part of agricultural water systems. These systems are suitable for field installation (with rain and direct sunlight protection), have a compact structure, and are robust and resistant to environmental conditions and chemicals. They are also suitable for the preparation of chlorine solutions by using raw irrigation water in an accurate and reliable manner. The systems include special functions for agricultural applications such as a wide range of control options; automatic dosage adjustment for nearby or distant fields or plantations; and simple and fast adaptation to changing water quality, weather conditions and agricultural factors. All Triteia standard systems are suitable for operation from main power or from rechargeable batteries such as solar panels. Triteia also offers larger chlorination systems that are suitable for large water quantities and flow rates. These systems are used in central water supply plants for irrigation or small chlorination systems and are especially suited for use by farmers close to agricultural growing areas. Read more about Triteia Technology and Triteia Systems. The team at Triteia has vast experience in the field of chlorination for agriculture in many different regions with varied climates. This, together with collaboration with farmers on unique technical requirements and ideas, led to a unique development process that culminated in advanced chlorination systems for agricultural applications with innovative features. From the moment Triteia offered a comprehensive solution that allows farmers to perform, control and manage simple and reliable chlorination process, many farmers reported immediate and significant improvements in the functioning of their irrigation systems. These improvements include water resource savings, a reduction in the need for irrigation system maintenance as a result of fouling, the option of irrigating a wider variety of agricultural crops intended for food, and the ability to use reclaimed or other polluted water.